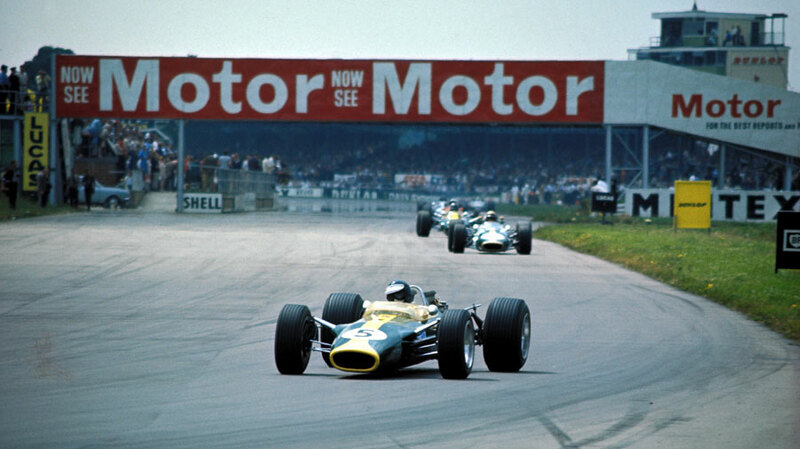 After two races where his Lotus failed to last the distance, Jim Clark bounced back with victory at Silverstone, his fifth win in the British Grand Prix in six years, but Denny Hulme's second place extended his lead in the drivers' championship to nine points. Lotus had had a busy 24 hours. During the eve-of-race practice, Graham Hill had smashed into a concrete wall when his suspension failed as he entered the pit-lane, causing his car to veer to the right - his engineers had spent the night rebuilding his car after parts were rushed to the track from the team's Norwich base. "Sixteen of us did three weeks' work overnight," an exhausted Colin Chapman admitted. To add to the team's woes, Clark suffered a puncture after driving over some of the debris. Despite this, both cars were on the front row of the grid. The race was described by The Times as "unexciting" but at least the 120,000 spectators were able to bask in glorious sunshine. Not for the first time, the start was rather chaotic. Hill's car was overfilled with fuel, soaking him in the cockpit, while Dan Gurney got into a row with officials who barred him from changing a wheel. Clark and Hill led early on, with Hill battling engine problems before his suspension collapsed on the 55th lap. He limped into the pits with his skewed rear wheel suggesting his day was over. But Chapman worked his miracles and within a minute Hill was back out, albeit down in seventh. However, not long after his engine blew. Clark was never remotely challenged as Jack Brabham, who was pressured throughout by Chris Amon, had mechanical issues of his own. Brabham executed an excellent team drive, holding off Amon long enough to ensure he could not catch the Brabham of Hulme.